I absolutely loved everything in my November box from A Horse Box, so when my boyfriend offered to order me a January box as a late holiday gift and then I found out there was only one box left, I couldn’t say no to the generous offer! 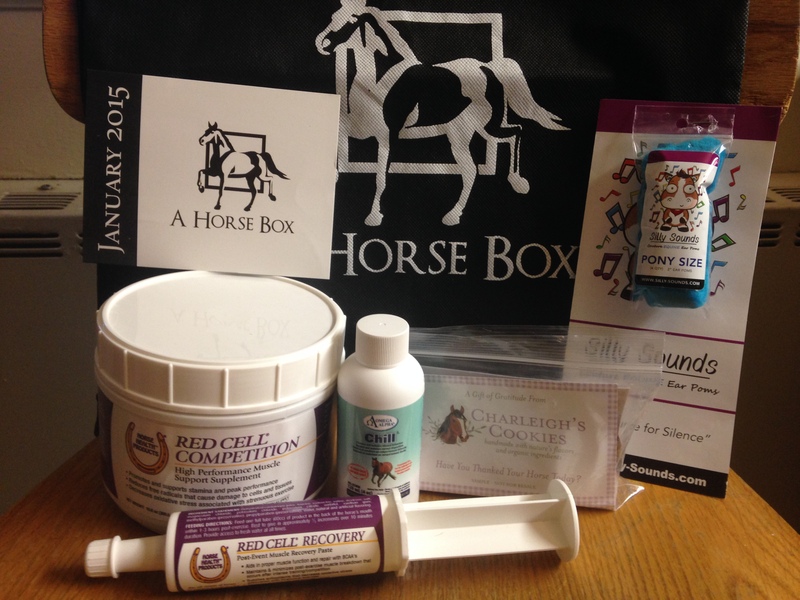 If you don’t know about A Horse Box, it is a monthly subscription box service that sends handpicked items to your door featuring brands like Absorbine, Equine Organix, Likit, Omega Alpha and many more. With three different types of boxes in varying prices; the original A Horse Box that includes four to six items, A Tack Box which is a one time box with horse owner essentials, and A Mini Horse Box which features two to three items and will be returning some time this year. Prices start at only $17 and vary depending on how many months you choose to subscribe. A Horse Box subscriptions can be found here! The biggest and first things I noticed in the box was the container of Horse Health Products Red Cell® Competition Supplement and the tube of Horse Health Products Red Cell® Recovery Paste. I have seen the Iron Rich liquid from the Red Cell line before, but never these two products. I decided to read up on them and review the test study results to see what they were all about. The Competition Supplement is described as a high performance muscle support supplement that helps your horse perform longer, promotes and supports stamina and peak performance, reduces free radicals that cause damage to cells and tissues, and decreases oxidative stress associated with strenuous exercise. The study reported that the supplemented horses had “an increased ability to tolerate high intensity work” and “recovered faster”. The website describes the Recovery Paste as a post-event muscle recovery paste that helps horses recover faster, aids in proper muscle function and repair with branch chain amino acids, maintains and minimizes post-exercise muscle breakdown that occurs after intense training/competition, supplies antioxidants that decrease oxidative stress associated with strenuous exercise, and replaces electrolytes lost through sweat. Fun fact; they are derived from cantaloupe juice! Ax used to be on a a Horse Health Products joint supplement before I bought him and I have only heard good things, so I am looking forward to trying out these two products when our workload increases in the summer. I also love that the supplement is a full 30 day supply so I can really try out to product and see if there is a change with its use. I received an Omega Alpha product in my last box and it was nice to see another. This month was the Omega Alpha Chill™ for calming horses, especially those with pre-performance nerves. The product information says that it helps to focus the horse’s mind on the task at hand without negatively affecting performance or causing drowsiness. While Ax isn’t really in need of any calming (he needs the exact opposite), I do know of a certain pony who could use it on occasion. Although the bottle is only 4 0z, it contains around 3-4 doses, the perfect amount to have on hand for emergencies. 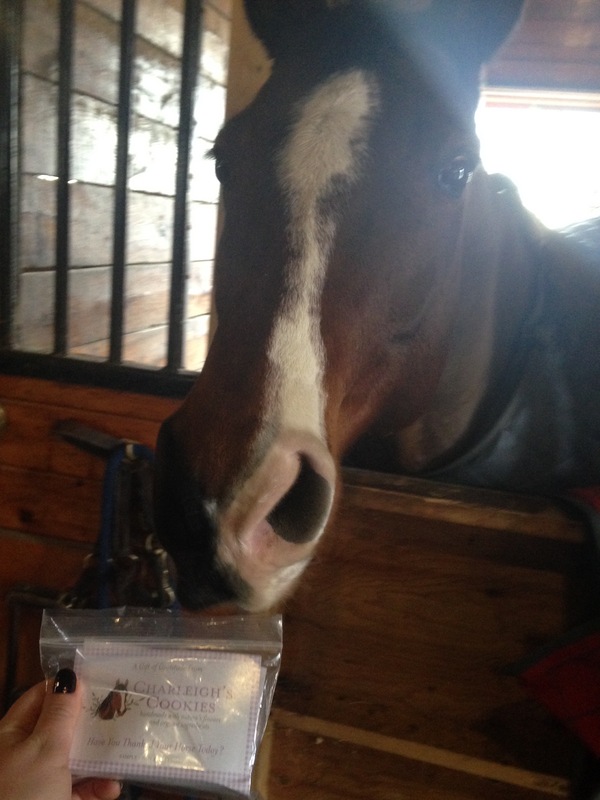 Its always a good day when horse cookies come in the mail! These ones are in a 3-cookie sample pack from Charleigh’s Cookies that includes their three flavors; the original Essential Swag flavor in the Hugs & Kisses bite size, the Southern Swag flavor that has an organic Georgia peach in the middle, and an organic cinnamon Sweetheart Swag. I don’t know who likes these more, Ax or me, because these things SMELL SO YUMMY, but his favorite was the definitely the Southern Swag. The last item in the box is from a company that is new to me that makes ear poms called Silly Sounds. I received one packet of Terrifying Turquoise Poms in the 2″ pony size which includes four poms. Not only do I love the color, but they are super soft and compress easily to be stuffed into place. They may be pony sized but Ax has super tiny ears for such a big body and I think they’ll fit just fine, but if they don’t the certain pony who needs the calming liquid could use some of these as well. Since Ax has been seeing the boogeyman a lot lately, I can’t wait to try these out. I did a little searching and totaled up the price of the products, seen above, to compare to the price of the box. The one-month subscription to my box was a total of $27 with shipping. The price of the supplement itself doubles that. Add the rest of the prices together and you get a grand total of $76-$94. No matter what way you slice it, the value of the box is triple the price! TOA Blog Hop 5: Fave. I like how you broke it down to show the true dollar value of the items in the box. I’ve seen these horse boxes, dog boxes, coffee boxes and have wondered about them. What a great way to become acquainted with new or different products. I thought it was neat to see what i would have paid otherwise. I love fjnding out about new products and brands. Definitely seems like you get your moneys worth with the box! I love the fun colors. They’ll be great for schooling. COOKIES! I love A Horse Box. Dude, how did I not know this exisited?? 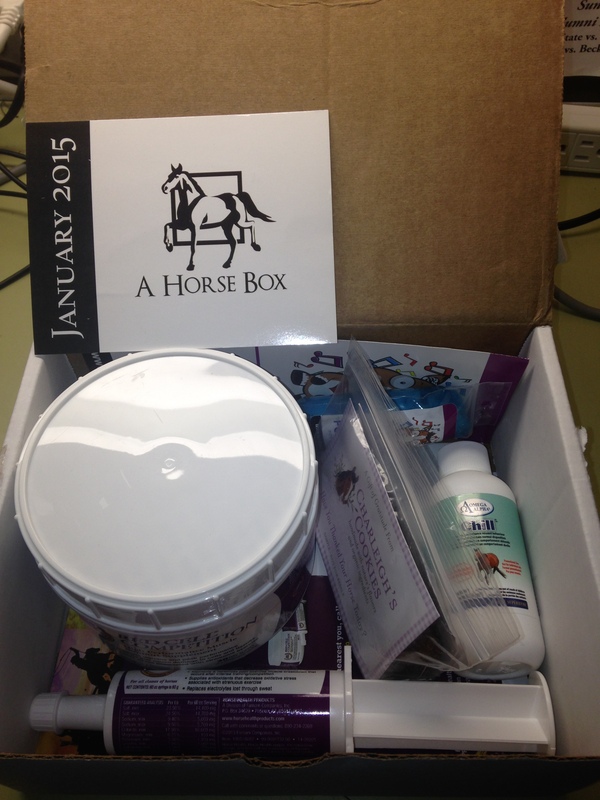 Its like a Bark Box…for horses and their humans. HOW COOL. Def a great bang for your buck. Sidenote, wish poms were legal in USEA events, I think they would really help us. I really want to subscribe!! Cool break down! I had a subscription for s year when they first started and they gave to many of the same products over and over.. But it looks like they have a new variety so that’s awesome!! That is the second time I’ve heard that. Maybe now that their business is growing they are getting a larger variety of products.